Doodle Jump is a game for iOS. I would like to hack the highscore of Doodle Jump. But I failed. Maybe other 1000 hackers came to the same point as me. You need a jailbreaked iPhone. Install Doodle Jump from App Store. You need Terminal app from Cydia. And also tcpdump is needed. 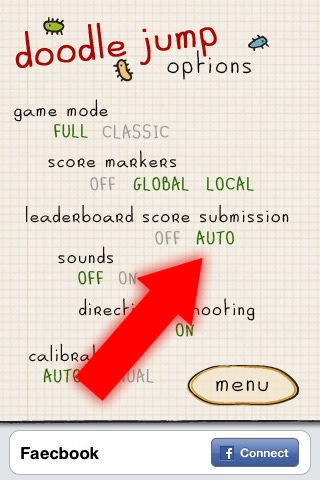 In the Doodle Jump options you must turn leaderboard score submission to auto. This cause that the score always will be submitted to http://limasky.com/. Before you start the game start tcpdump as root: tcpdump -w ifdump -i en0. So you can sniff the packets from the game. tcpdump saves all packets to file ifdump which will be send over WiFi. Let tcpdump run while you play the game. Start Doodle Jump and play one game. Only one game with score > 0 is needed. Exit tcpdump with CTRL+C and transfer the ifdump file to your PC. With a Packet analyzer like Wireshark you can now read the packets from the sniff. At this point I failed. I failed because I need to send the right shash variable to the server. It’s hashed for each score. If the hash is wrong the server will not take the score. At this point you need to crack the binary file of Doodle Jump by disassembling the code. Update, 2015-01-04: I sniffed the packets again and it’s still working with new variables like User-Agent and URL parameters. Still no HTTPS used, still the same hashing function. They only changed the submission timing. The score isn’t submitted immediately. After a few minutes after the game was over the score has been submitted.